Egyptian President Abdel-Fattah El-Sisi said on Sunday that scientific research in Egypt is “still inefficient” due to scarce resources. "The industry of scientific research has been developing, yet it needs more effort ... we as a government have been exerting all our efforts to offer the needed chance to our Egyptian and African sons and daughters to grow more in this field," El-Sisi said. El-Sisi said that Egypt and the African continent will depend on high calibre and distinguished thinkers to lead them in the field of scientific research. His comments came during a session titled "The Future of Scientific Research and Healthcare Services" at the Arab and African Youth Forum in Aswan. 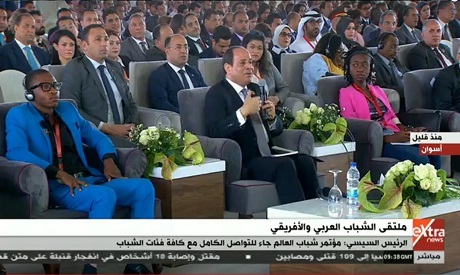 At the end of his comments, El-Sisi said that his country will always offer all its resources to the African youth "with all respect, love, and humility." The panel speakers at the session included Egyptian Minister of Health Hala Zayed, Minister of Higher Education Khaled Abdel-Ghaffar, and African and Egyptian officials. Abdel-Ghaffar announced that an event called the Global Forum for Higher Education and Scientific Research will take place next month in Egypt’s New Administrative Capital. It will host a large number of prominent personalities from various universities, institutions and international organisations, he said, and will take place from 4 to 6 April. The health minister said during the session that Egypt has received the accreditation to produce many medicines in country. "We have started serious steps in the manufacture of oncology drugs, we have obtained international accreditation for the production of many medicines in Egypt, and we are working to standardise drug registration procedures in Africa to make them available at a low price," she said. The other sessions and workshops at the youth forum on Sunday will tackle innovative ideas to realise Arab-African integration in various domains, including in public services. Attendees will review the role of emerging companies in developing scientific research and health services as well as upgrading Egyptian infrastructure, especially in the fields of education and health. Talks will also tackle an array of innovative ideas making use of modern technology in boosting investment, especially e-trade. Achieving peace and security in the Arab and African regions, in order to achieve economic growth and encourage tourism and investment, will also be discussed. The Arab and African Youth Platform is being held as part of the recommendations of last year’s World Youth Forum. Aswan was announced by El-Sisi at the World Youth Forum as the “capital for African youth” in 2019.